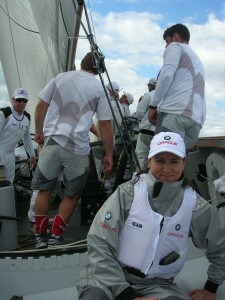 Having spent over 17 years as a dinghy racing journalist covering events such as the Olympic Games and other major international regattas for Yachts & Yachting magazine, Sue Pelling joined Yachting World as Editor of yachtingworld.com – the accompanying website to Yachting World magazine – in 2000. She then spent nearly eight years covering most of the world’s major regattas for both website and magazine, including the Vendee Globe, Volvo Ocean Race, America’s Cup and numerous extreme sailing events such as Ellen MacArthur’s round the world 71-day record-breaking challenge. During her full-time job covering these events she’s been able to exploit her passion for interviewing which has allowed her to build up an extensive portfolio of profiles with some of world’s premier sailors and personalities including America’s Cup winners, Olympic sailors, yacht owners and designers. She was also privileged to be the sole journalist granted permission to interview many of the European royalty including HRH The Crown Prince of Denmark and King Constantine during the Dragon 75th anniversary regatta in St Tropez in 2004. As well as writing for many of the main specialist yachting titles, she’s had published work in the Daily Telegraph, Times, The Financial Times, The Field magazine, European Business magazine, Devon Life, Land Rover World, and a business sponsorship feature about the America’s Cup published in the Brazilian-based, Luxury Avenues magazine. She is now working as a freelance journalist specialising in yacht racing, marine, lifestyle and travel, producing features for many of IPC Media’s marine titles including Yachting World, Yachting Monthly, Practical Boat Owner, Motorboats and Yachting, Motorboats Monthly, and Superyacht World. Other regular work has included web reporting at Antigua Sailing Week, Cowes Week for event organisers and Yachting World, copy editing for Hanseatic Lloyd’s Onboard shipping magazines, nautical fashion features for Yachting World and Surrey Occasions magazine. Published work features in other titles including Seahorse magazine, Cowes Yachting, Onboard Superyachts, and All At Sea. Sue also covered the Vendee Globe for British sailor Mike Golding, and had a weekly column in the Irish Independent, ghost-writing for Damian Foxall – watch leader aboard 2009 Volvo Ocean Race yacht Green Dragon, during the race. Recent work has included writing the editorial for the JP Morgan Asset Management Round the Island Race official programme, covering the Tall Ships Baltic Series for Sail Training International, and the St Petersburg Times, and reporting on the annual Endeavour Trophy dinghy champions of champions race at Burnham-on-Crouch. Other events include the Heineken Regatta in St Maarten, and Antigua Sailing Week working as press writer, Media Manager at the Historical Seas Tall Ships Regatta in May. Press writer for the Round the Island race and Cowes Week, and press coverage at the Laser Radial Youth World championship in Largs, Scotland. Her most recent work includes press reporting for the Mount Gay Round Barbados Race Series, the EFG Sailing Arabia The Tour, Cowes Week, Round the Island Race, and the Govenor’s Cup – South African offshore race from Cape Town to St Helena Island.